This entry was posted on May 31, 2017 by Nick. Father’s Day is on the horizon, and Hamper.com has a fantastic range of gifts, perfect for your dad, step-dad or grandad! Discover exciting, delicious and thoughtful hampers to surprise him on 18th June. All of our Father’s Day gifts are also eligible for free next day or nominated day delivery throughout the UK, so take full advantage and order it straight to his door. 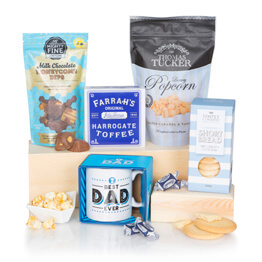 Take a look at a selection of our favourite Father’s Day hampers for ideas and inspiration and buy him a present he will never forget. You can also discover more exciting gifts from our full Father’s Day range. This quirky gift box is filled with British craft ales, luxury Father’s Day chocolate and a selection of male grooming products including shaving cream and balm. It is the perfect gift for any dad who appreciates good beer and even better beards. Treat him to the Bluebeards Revenge Beer Hamper this June. The Hamper is perfect for a father who likes to indulge in fine foods. Stuffed to the brim with sweet and savoury delights including cheese, chutney and chocolate, this selection is a crowd pleaser. You can even add a personalised message and make the Alcohol Free Hamper for Dad gift that bit more special. 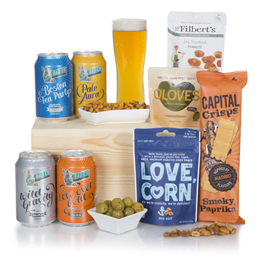 Filled with IPA, fresh cheese and snacks, this selection of luxuries have all been carefully chosen to complement each other and create a treat for the taste buds. Surprise your dad this Father’s Day with The Beer Feast Hamper! If you dad appreciates the finer things in life, then he will love this gift box! This hamper includes a bottle of Gentleman’s Collection Cabernet Sauvignon, luxury Australian red wine, and a delicious box of dark chocolates chosen specially to complement the wine. Show your dad you care with a Hamper for Him. Clearwater Hampers has been creating beautiful and delicious gift baskets since 1979. We have a fantastic range of presents available for any occasion. If you haven’t spotted a Father’s Day gift that tickles your fancy, browse our full range of Hampers for Him. Purchase your gift hamper online before 2pm to qualify for free next day UK delivery. You can even send your hampers abroad with our speedy worldwide delivery and speciality international hampers. With Hamper.com, you never need to miss a special occasion again. You can find our complete Father's Day Gift Guide here.